A teenage cop named Dayoung from "the future" goes back in time to 1986 to stop a time-stream crime by a company called Quintum Mechanics. In "the future," she argues with her boss to send her back in time to stop Quintum, and he agrees. In "the past," 1986, she appears in the lab where Quintum Mechanics, newly formed by a few scientists, is testing their "Q-Engine." This is the machine that will alter the future, according to Dayoung. Before she can really explain anything, however, her gear picks up a call on the police band, and she flies off in her rocket suit to investigate. She collars the criminal, but the 1986 cops try to arrest her too, and she has to rough them up. Then the scientists from Quintum catch up to her and pull her into a cab, to get her away before more "present day" cops show up. This story is based on a very interesting premise. Rather than "the present" being 2013, and the future being some distant time, such as 2030, in this story, "the present" is 1986, and "the future" is 2013. What I like about this is that the 2013 time period depicted in the comic is clearly far more futuristic than our real world in 2013. Whether we are looking at an alternate reality, or whether the series will lead us to the idea that our world is the "correct" path on the timeline, and the future-tech based 2013 is the "anomaly," remains to be seen. Overall, I enjoyed this twist on the typical time travel story. The story overall is pretty good, although parts are confusing and required me to re-read them two and three times before I could figure out what was going on. The dialog is OK, but there are no strongly-drawn characters other than Dayoung. I realize she is the star of the show, but every strong character needs a supporting cast. I suppose the Quintum Mechanics people could serve that role, but none of them seemed particularly interesting or promising yet, at least in this issue. I will give it time and see what develops. The art by Amy Reeder is good, if different. She has a style that reminds me a lot of Barry Kitson's LSH days, which I used to enjoy. Reeder does a good job with facial expressions. However, I find her layouts occasionally distracting. Ideally, the first time through a comic, I should not notice the layouts consciously... they should only impact my mind on a sub-conscious level. It should take a second or third pass through a comic before I notice exactly how the panels are presented on the page. That's true for most of this issue, but on several pages the layout is so unconventional that my eye would not naturally flow from panel to panel in the correct order, and I had to stop and figure out "which panel do I read next?" That really shouldn't happen on a comic that has been laid out properly. Overall, my impression of this comic is mildly positive. 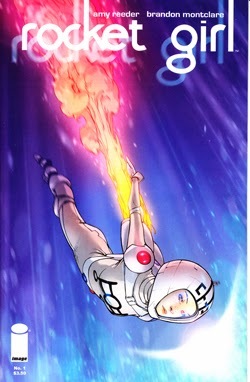 It is a decent opening, but nowhere near as compelling as other recent first-issue starts like Astro City or Lazarus. I'll probably try another issue or two of it and see how things go. But if it doesn't get somewhat better, it probably won't make the pull list cut -- especially since at this point I would have to drop something I currently collect in its favor.